The greatest romances are, for a reason which eludes me, all about forbidden love. Whilst constancy is generally required of a hero, the romantic heroines in the stories which make women swoon do not appear to be governed by the same strictures. 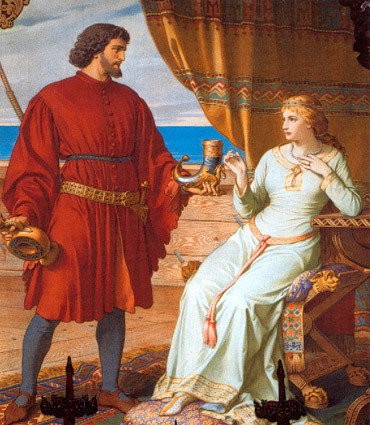 Lets just take a moment to look at Guinevere and Isuelt, the two most famous of romantic females, yet both appear to have round heels when it comes to their royal husbands best mate. Is this really a desirable quality? I don’t like Sir Lancelot. Oh I know some will complain, but he was introduced to the corpus of Arthurian literature quite late on by the French writer Cretien De Troyes. let’s face it, a French writer adding a character that cuckolds the British king and turns his (previously virtuous) queen in to a floozy desperate for a Gallic hunk is clearly having a laugh. Even Lancelot’s name is a dodgy pun, we shall speak of him no more. The Cornish Tristan, although a skilled harpist and singer, is also a consummate martial artist, which is handy because he is a hot-head too and, like many a hero of days gone by, will get in to a ruck as soon as look at you. Despite his skill he manages to get wounded by a poisoned sword whilst saving the Kingdom from it’s annual tribute to the Irish. The only person who can cure him is the daughter of the man he has killed so off he goes, pretending to be a troubadour, to meet the beautiful Isuelt who nurses him back to health. On his return he tells his Uncle, King Mark, of the Irish belle and is promptly sent back to win her hand for the ageing monarch. Fortunately there is a dragon to be slain and the princess is on offer as the prize for this act of oversized-vermin control. Tristan duly tops the lizard, once again managing to get himself poisoned in the altercation, and is soon back in Isuelt’s tender care. "Oh alright, what's the worst that can happen?" mother, in an effort to save her daughter from a loveless marriage, mixes a love potion into a bottle of wine for the happy couple to drink on their wedding night. Naturally, Tristan amuses his charge on the long sea journey with many songs until Isuelt accidentally shares out the enhanced wine and the two are overcome with desire for each other. They try to pretend that nothing happened and the wedding goes ahead. In some variations the bespelled pair manage better at keeping their feelings hidden than others but more often than not they are discovered and have to run away, living on moors and other inhospitable places while an enraged King Mark’s knights search the lands, hot for Tristan’s blood. Eventually Isuelt is returned to her bitter husband while Tristan flees to Brittany and there marries another princess, also called Isuelt. Spending his frustration in a succession of combats, Tristan is wounded so badly that only the original Isuelt can save him but she arrives too late and dies of sorrow over his corpse. Apologists for Tristan and Iseult claim that their love was brought into it’s full heat by the accidental consumption of the love potion and it is therefore not their fault, but “we were drunk, we couldn’t help it” has never been a good excuse. If you ever find yourself in the same situation then calling off the wedding is probably the best move and will save a lot of heart ache all round. Unless you want to bring a kingdom to it’s knees and spend the rest of your life living on the run while your erstwhile friends attempt to bash the life out of you, I suggest you do not use medieval romances as a model for your love life.